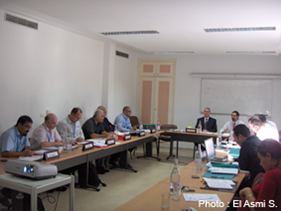 According to the recommendations made by the Contracting Parties at their last Ordinary Meeting (Almeria, January 15th-18th 2008), particularly the request that a report be drafted on the situation of biodiversity in the Mediterranean and on the impact of climate change observed, RAC/SPA initiated an appraisal of the information available on the Mediterranean. A Synthesis of documents and an initial status of knowledge. 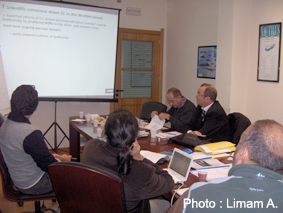 The report has been sent to the National Focal Points and the partners (CBD, IUCN-Med, etc.) click here to download it. In addition, a working group constituted by a team of international experts complemented by Parties’ National Experts was set to develop a detailed insight on vulnerability and impacts of climate change on Mediterranean biodiversity, in accordance with the outcomes of the 15th Ordinary Meeting of the Contracting Parties to the Barcelona Convention and the Almería Declaration. This activity has been developed through a process involving biodiversity concerned ministries of all the riparian countries. Following the three above meetings, sub-regional conclusions/recommendations and sub-regional synthesis reports specific to each cluster were elaborated. 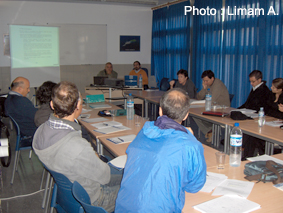 Finally, a Regional Working Meeting was held at the Cooperativa Nautilus premises (Vibo Valentia, Italy) on December the 11th and the 12th 2008. Gathering RAC/SPA Coordination Team, two representatives from Nautilus and the three international consultants, recruited for that issue, the meeting permitted the elaboration, on the basis of the sub-regional conclusions/recommendations, a synthesis of conclusions/recommendations at regional level. Furthermore, a regional synthesis report on biodiversity and climate change impacts has been prepared. 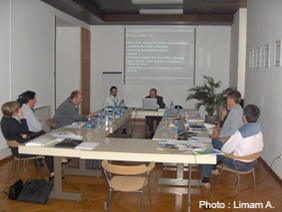 All documents (national reports, sub-regional reports, regional synthesis report, sub-regional conclusions/recommendations and regional conclusions/recommendations) were submitted to the Ninth Meeting of Focal Points for SPAs, held on June 2009 (Florianna, Malta) and accepted.